Detective James "Sonny" Crockett is a fictional character in the NBC television series Miami Vice. Crockett was originally portrayed by Don Johnson in the television series from 1984 to 1990, and later by Colin Farrell in the feature film in 2006. Crockett appeared in every episode of Miami Vice except the fifth season episode "Borrasca". He has also appeared in video games and various popular culture references of the show. James Crockett, more commonly known as Sonny Crockett, is a detective in the Metro-Dade Police Department (now Miami-Dade Police Department). He holds the rank of sergeant in the MDPD. Crockett is a former University of Florida Gators football star who had sustained an injury which put an end to his sports career. He served two tours in Vietnam – or as he calls it, the "Southeast Asia Conference". Crockett first appears in the pilot episode of Miami Vice (1984) as an undercover vice cop on the trail of a Colombian drug lord. While undercover he meets Ricardo "Rico" Tubbs (Philip Michael Thomas), an NYPD undercover officer, who too is on the trail of a drug dealer and cop killer, Calderone (Miguel Pinero). Calderone and "the Colombian" are the same person. Crockett and Tubbs both go undercover as Sonny Burnett and Rico Cooper respectively, trying to get closer to Calderone. They are successful and in the end capture him. Just as they go to see him in jail, Calderone makes his $2 million bail and is on his way out of the country. Crockett promises Tubbs that they will get him, but as reconciliation asks him if he is interested in a career in Southern Law Enforcement, thus beginning their new partnership. At first Crockett appears difficult to get along with (a notion, which he admits himself in episodes Brother's Keeper, and Nobody Lives Forever). He is a man of few words with a tough exterior, but can also be a loving and caring person. His softer side is revealed when innocent victims die or suffer injustice at the hands of villains or when someone pays the price for others' mistakes. Crockett despises those who use or deceive others for self-serving reasons. He is a highly moral person who assiduously honors his own promises and commitments and he expects no less from others. Crockett's hard exterior stems in part from the type of work he performs and also from rough experiences from his past, losing friends, partners, and other people he has been close to or otherwise deeply cared about. From time to time, these memories haunt him and he struggles with feelings of guilt and because of difficult decisions he has had to make. He is very close with his friends and colleagues, Switek, Zito, Gina and Trudy, as well as with his supervisor (Martin Castillo) and especially with his partner, Ricardo Tubbs. Crockett is depicted as a rogue character who lives by his own set of rules and he is often angered by and in conflict with orders from his superiors. This part of his persona is emphasized by the fact that he lives on a sailing yacht moored in Miami's luxurious Miamarina and keeps an alligator as a pet on the same boat. The character was to have used a SIG Sauer P220 as his main firearm, but this was replaced by the Bren Ten that is a more visually intimidating and powerful handgun. Crockett's role in the investigations decreases towards the end of the series, especially after he suffers amnesia and briefly adopts his cover of Sonny Burnett. He also loses faith in his work, realizing that he cannot win the battle against all the drug cartels and crooks. Tubbs later comes to the same realization. The two of them resign from the police force and turn in their badges in the final episode of the series. The name "Sonny Crockett" had previously been used for a criminal played by actor Dennis Burkley on Hill Street Blues in 1983, where creator Anthony Yerkovich was a writer. Coincidentally, Gregory Sierra who later played Crockett's original supervisor (before Edward James Olmos was cast) appeared in the same episodes. 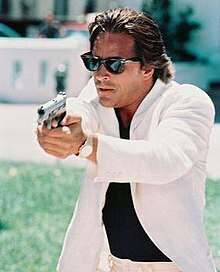 For the 2006 film adaptation of Miami Vice, James "Sonny" Crockett was completely reinvented and thus had no relation to the television series character. He had no backstory, the only backstory being for his alias Sonny Burnett. The television version of Crockett carried a lot of personal baggage and so the new Crockett, by contrast, could travel light and sleek, with no backstories to burden the picture with exposition. For the 2006 film, Colin Farrell stated, "If I was to think about the early Crockett, I would have been in trouble because I would have been arguing over the suits that I wanted to wear and no socks with my slip-ons, and all that kind of stuff". Furthermore, Farrell didn't look to Don Johnson's portrayal for much inspiration. In 2006, coinciding with the release of the feature film, a Det. James "Sonny" Crockett action figure was released. It included a figure of Crockett and a plastic alligator. In 2006, Grand Theft Auto: Vice City Stories was released, and included a character based on Crockett, who interacts with Lance Vance, voiced by Philip Michael Thomas, and Phil Collins himself, who performs a full length in-game version of "In the Air Tonight". In Back to the Future: The Game, Sonny Crockett is one of the pseudonyms that the player can choose for Marty McFly. Sonny's backstory of college football prowess and being a Vietnam War veteran were transferred onto the character Bobby Bridges on Don Johnson's other cop show Nash Bridges. In the TV comedy series 30 Rock, Kenneth Parcell has a pet parakeet called Sonny Crockett, but the fact he'd owned it for 60 years suggests it wasn't named for the character. ^ O'Connor, John J. (1985-06-28). "Critics' Choice; Broadcast TV". The New York Times. Retrieved 2007-12-18. ^ a b Scott, A.O. (2006-07-28). "'Miami Vice': Operatic Passions, Yet Cool in the Heat". New York Times. www.nytimes.com. Retrieved 2007-12-19. ^ Travers, Peter (2006-07-20). "Miami Vice: Review". Rolling Stone. Retrieved 2009-05-11. ^ Breznican, Anthony (2006-07-26). "'Miami Vice' makes series of changes". USA Today. Retrieved 2009-05-10. ^ "Advanced Primetime Awards Search". Academy of Television Arts and Science. www.emmys.tv. Retrieved 2007-11-03. ^ a b "Miami Vice". Hollywood Foreign Press Association/Golden Globes. www.hfpa.org. Archived from the original on 2007-03-13. Retrieved 2007-11-03. ^ "Mezco Toyz Miami Vice Detective James "Sonny" Crockett Action Figure". Superherotoys.com. Archived from the original on 2007-12-20. Retrieved 2009-05-11. ^ Paphides, Pete (2008-04-25). "Phil Collins casually serves notice of his retirement". Times Online. London. Retrieved 2008-05-08. ^ 30 Rock episode "Cutbacks"
This page was last edited on 3 March 2019, at 23:09 (UTC).